When Twentieth Century Fox Television announced in 2015 that its highly successful series The X-Files would return to television with a six-episode event series, the studio seized the opportunity to demonstrate its commitment to environmentally responsible production practices. The new series filmed in 40 individual locations across British Columbia, including Vancouver’s North Shore Studios, with each requiring elaborate set construction, lengthy transportation demands, and long shooting hours calling for sustained electricity and fuel use. To mitigate these challenges, Fox brought on Zena Harris of Green Spark Group to serve as the sustainable production consultant. Thanks to her efforts and those of the entire crew, the production managed to divert more than 81% of its total waste from landfill, recycle 100% of the aluminum and steel used in set construction, and avoid 33 tonnes of CO2 emissions, generating nearly $41,000 in cost savings. With the return of The X-Files, Carter and the crew were eager to pick up where they left off. See below for an in-depth look at the sustainability measures implemented during the production. Before filming began, Harris conducted meetings with each department individually to determine the unique ways their teams could embrace sustainability, drawing primarily from the Producers Guild of America’s Green Production Guide, which Fox developed in collaboration with its peer Hollywood studios. The crew committed to tracking and reporting energy consumption data and set goals to reduce the production’s total environmental footprint, including a no idling policy for vehicles on set, discouraging plastic water bottles, and a commitment to reuse and recycle props and set materials wherever possible. As the production schedule progressed, the crew kept this culture of sustainability alive by posting weekly “green tips” on call sheets and flyers, erecting a “Green Wall of Champions” at the production office to celebrate their environmental achievements, and incorporating “green talks” into the weekly construction department safety meetings. 100% of the lauan plywood purchased for set construction received certification from the Forest Stewardship Council (FSC), a nonprofit organization that promotes responsible management of the world’s forests. The remaining lumber purchased for the production was all sourced locally from Canadian forests and certified by the Sustainable Forestry Initiative (SFI). 100% of the aluminum and steel used in set construction was recycled. The set decorator rented props when possible and consulted with previous shows that filmed in the area to re-use any leftover materials. The production office prioritized vendors with take-back programs and returned products after production wrapped. Beyond set construction, responsible waste management in all departments remained a high priority for The X-Files. The mandate prompted several innovative strategies, including donating materials to local community organizations and recycling used polystyrene foam. As a result of these efforts, the production was able to divert 81% of its total waste from landfill. By replacing the use of plastic water bottles with gallon jugs of water and reusable bottles, the production was able to avoid the use of 45,760 plastic bottles and save nearly $35,000. Scripts and memos were most often distributed digitally, but where printing was necessary, the production office used 100% FSC-certified paper products. Both at the production office and on the studio lot, Keep It Green Recycling collected paper, batteries, CDs/DVDs, plastics, glass, foam, bottles, ink cartridges, paint cans, and light bulbs. Rather than dispose of set materials entirely, the crew extracted, reused, and donated core building materials to other productions, such as building flats, four large stacks of OSB boards, and two dozen large pony walls. Set Decoration donated materials to a range of organizations, including a local pet shelter, MCC Thrift Store, Habitat for Humanity, and the Salvation Army. The team even donated granite headstones to a local monument company. Wardrobe used leftover costumes from other productions and purchased clothes from second-hand stores whenever possible. After production wrapped, the team worked with Our Social Fabric to donate or recycle remaining costumes. Set Construction donated five boxes of window blinds to Habitat for Humanity. A previous production donated eight sets of tires to The X-Files, which then sent the tires to be recycled at KalTire. The catering department used compostable plates and cups, as well as recyclable cutlery and cup lids. The plastic water jugs used to refill water bottles were also recycled. All organics on set and in the office were composted, and a total of 40,160 pounds were diverted from landfill. The X-Files relied heavily on Expanded Polystyrene (EPS) foam to construct integral components of several sets, including the UFO featured prominently in the opening of the first episode. EPS is a material common to set construction but has historically been a challenge to green production coordinators looking to reduce waste, as recycling vendors tend not to accept EPS pieces containing hilti glue, metal, or hard coats of paint. 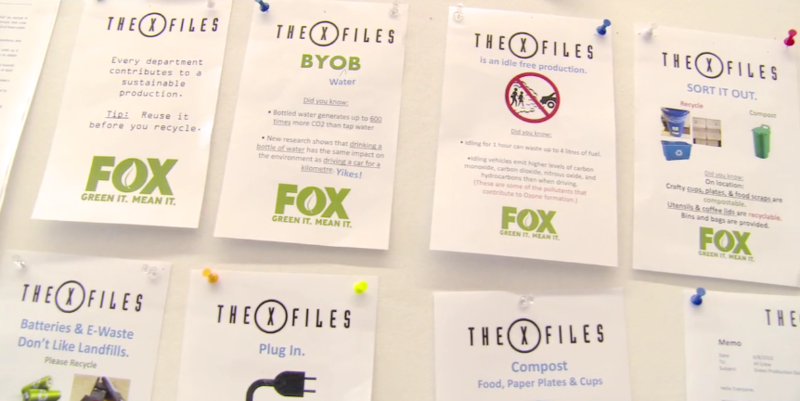 On The X-Files, however, the crew was able to work with Blue Planet and Keep It Green Recycling to recycle the “dirty” foam, making The X-Files one of the first Hollywood productions to address this industry-wide sustainability issue. 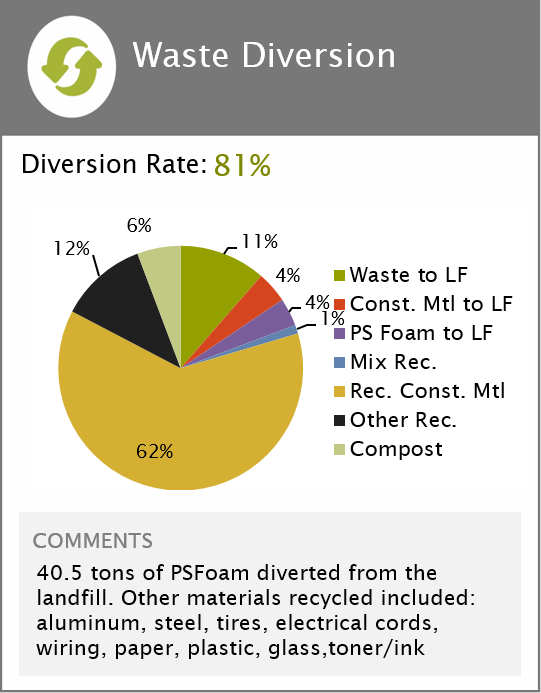 In total, the production recycled 35.5 tons of foam and returned 5 additional tons to the vendor, generating more than $1,000 in cost savings. The culture of sustainability that Harris and her team established at the outset of the production also enabled crew members to devise their own environmental solutions. In particular, the crew noticed that wastewater from air handling units on the studio lot was not reused or recycled but rather discharged into the storm drain. After discussing this with the North Shore Studios maintenance department, the crew successfully spurred a pilot project to recover and store this wastewater for future use. These measures will continue to affect future North Shore Studios productions and allow them to more responsibly manage their water use. The Transportation department used bio fuel blends in nearly all vehicles, including a low sulfur diesel fuel with a 5% bio blend (B5) and a 10% ethanol (E10) blend in gasoline. The crew selected LED lights whenever possible, including for background lighting and on key sets such as the UFO and the talk show set. When filming on location, the crew relied on generators for electricity, which used a 5% biodiesel fuel blend. The use of this bio blend was encouraged throughout production. From day one, the production implemented a no idling policy for all vehicles. Hybrid vehicles were used when possible for airport pick-up in both Los Angeles and British Columbia. Fox is proud to support the Green Production Guide, a project of the Producer’s Guild of America promoting best practices in sustainable film and television production. The X-Files event series is now available in a variety of home entertainment formats.